Albatrosses in the North Pacific Ocean are ingesting plastic debris from a huge floating garbage dump, even in areas far from any cities, scientists say. Researchers at the University of Hawaii found that Laysan albatrosses that nest on Kure Atoll, a small island in the middle of the Pacific, ingested almost 10 times the amount of plastic that birds of Oahu, Hawaii, did. Researchers said they were surprised that the two bird populations show such a marked difference in their garbage foraging. "We suspected that there may be some differences in the amount of plastic that was ingested," said Lindsay Young, "but to discover that birds on Kure Atoll ingested 10 times the amount of plastic compared to birds on Oahu was shocking, particularly since the colony on Oahu is less than an hour outside of urban Honolulu, and is much closer to the garbage patch in the Eastern Pacific between Hawaii and California that has received so much attention." Albatrosses nest in colonies and forage for their chicks' food over vast areas of the ocean. Young and her colleagues tracked the birds from their nesting sites to their foraging areas by putting miniature tracking devices on them. They also examined the regurgitated stomach contents of the chicks at the nesting sites. 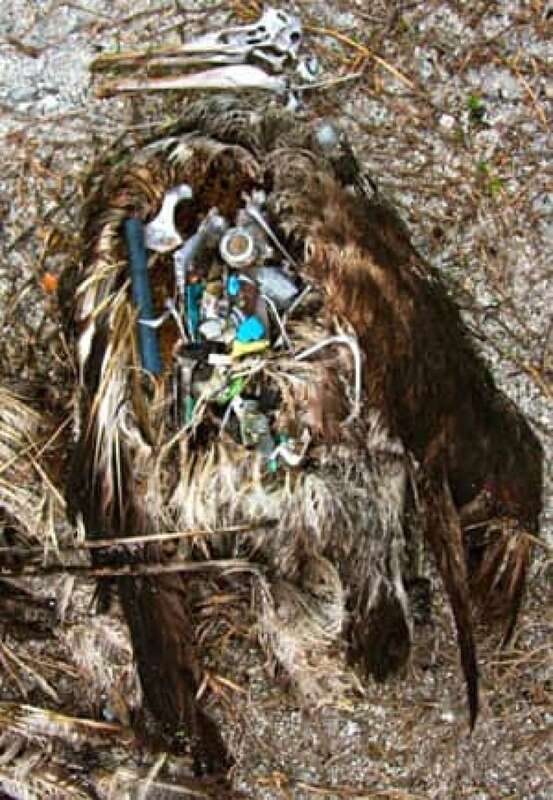 The tracking data found that the hunting territory of the birds from Kure Atoll overlapped with the floating garbage patch in the western Pacific Ocean off of Asia. The garbage gathers in an area the size of the continental U.S. called the North Pacific Gyre. The researchers said virtually all of the plastic pieces ingested by the Kure birds had Asian characters on them, while the garbage found in the Oahu birds didn't. Most of the garbage the researchers could identify consisted of equipment from the fishing industry such as line, hooks, light sticks and plastic tubes called oyster spacers. While many albatrosses are able to regurgitate the plastic debris they ingest, thousands of the birds die every year from eating garbage. It can block the birds' digestive tracts and expose the birds to toxic chemicals. Young said the most unusual item found among the items the birds threw up was a sealed jar of face cream, with the perfumed lotion inside still intact. "We were sorting through these boluses right after Christmas, and there were so many small plastic toys in the birds from Kure Atoll that we joked that we could have assembled a complete nativity scene with them," said Young. Young's research appears in this week in the journal Public Library of Science ONE. Good riddance to plastic bags?